Of course this attempt to make sense of whom the Bush presidency serves is just a brief moment in Michael Moore’s scattershot take on the American presidency. It’s left open whether we are to assume that Bush is one of those presidents who fall into Whitehead’s “aristocratic” category, and that other presidents represent, if not quite the people, then at least an interest much broader than the super-rich. Moore’s documentary is not a film of political thought (à la Errol Morris’ recent The Fog of War ), but a film of insistent righteousness. B. Ruby Rich is absolutely right when she says in her Sight and Sound piece that “experience is more valued than evidence; appeals to emotion tend to succeed over the most perfectly crafted argument.” (2) Or at least she’s absolutely right concerning Moore’s film. Her point is more general and concerns America itself, but if Moore’s a symptom of contemporary America, we should maybe look less at his left-wing stance than his insistent righteousness that leaves us undeniably angry – but angry with whom exactly? With Bush, certainly; with Al Gore also, who early in the film is shown feebly appealing to the laws of the US as various ethnic minorities insist that democracy has not been served after the last election. If Moore’s purpose above all else is to make not an aesthetic object, but a film to depose the president (as he’s claimed) his very righteousness undermines his desire to persuade the electorate, and replaces it with the psychology of a witch-hunt. Here there is everybody from Bush junior to Bush senior to various Saudi royals to the Bin Laden family. But then there is also Gore, and another Democrat John Tanner, who has no intention in sending his son to Iraq, despite Moore’s insistence that since the Senate had voted for the war they should send their own children to fight in it. Republican and Democrat, Christian and Arab are implicated in the ever-advancing corruption of America. Moore is so hysterically insistent that he leaves sceptics feeling naive. You come away from the film believing any attempt at democracy in America is a waste of time and energy, on the one hand, and on the other that George Bush’s incompetence is completely responsible for this decline of the American empire. This is inconsistent yet at the same time doubly deflating. By opening his film with the election results, and the dodgy count in Florida, Moore gives the impression that this was the day democracy failed. But then later in his film we’re told the Saudis have about 80 trillion invested in the United States, well over five percent of the country’s net worth. This understandably leads Moore to speculate that the Saudis have a huge say in America, but what he doesn’t do is trace the genealogy of investment in the States, so we’re left wondering how much of it has been invested during Bush’s presidency, or, if we take into account all the handshaking moments Moore shows us of Bush’s dad in cahoots with the Saudis, whether it was Bush Snr who was responsible for selling off the country. Moore’s anthropocentric witch-hunt leaves little room for the vagaries of international finance: the kind of tectonic shifts in geopolitics that make political action only part of the process. It’s as though Moore’s fundamental purpose isn’t even to make a film about the Bush administration and its bungling avariciousness, but rather a counter to the administration’s own emotive rhetoric. 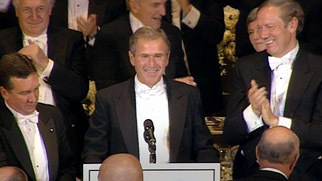 Where Bush points the finger at Afghanistan and Iraq and talks of evil-doers, Moore points the finger back and offers Bush and Saudi Arabian leaders up as devils incarnate. This will appeal to anyone who feels emotionally disenfranchised, who feel Bush, Cheney, Rumsfeld and co have had it all too easy with their embedded journalists and facile press conferences. But Moore gets stuck in the groove, and allows his documentary to skirt all over the place, offering us opportunities to laugh, cry, hiss and boo as he gives information less on the basis of an argumentative through-line than as a way of allowing us to offload our political frustrations. Thus it doesn’t really matter that Moore appears to contradict himself on the whole issue of the soldiers in the military. At one moment, they’re the hapless American poor roped in by recruiters hanging out at shopping malls looking to sign up the unsuspecting. At another, they’re bubblegum psychopaths immersed in video games and popular music who see the invasion of Iraq as a huge high. By the end of the film they’re heroes who only want from their leaders a real reason to fight for their country. So initially they sign up because they want a bit of cash, to travel the world and get an education, then they’re in it for the sheer thrill of carnage, and then they just want to fight for the good of the world. Now this needn’t be innately contradictory – a soldier’s life could easily go through these three stages – but Moore doesn’t try to explore the emotional psychology of a young soldier, or his own feelings towards contradictory emotional states. Instead he’s much more interested in the audience’s psychology – in the consistency of the audience’s sense of righteousness. Yet, with this interest in audience perception, in what context would Moore want his films to be placed? Presumably where Paul Arthur places them in his article in Film Comment on the essay film (3). One of Arthur’s key points here is the idea that essay films play with our sense of tense: “they fracture epistemological unities of time and space” as they escape the confines of the traditional documentary from John Grierson to cinéma verité. However, many would argue that this epistemological fracturing demands an ethical stance which Moore lacks. In his enraged attack on Michael Moore, Christopher Hitchens touches upon this point. He disentangles some of Moore’s epistemological fracturing and sees Moore’s arguments fall apart – ironically, in part because they share some of the same assertiveness Hitchens practices. Hitchens says after working away at Moore’s contradictory points of view: “Either the Saudis run US policy, or they do not. As allies and patrons of the Taliban regime, they either opposed Bush’s removal of it, or they did not.” (4) For Hitchens, this essentially proves Moore’s a worthless dissembling character. But while we needn’t engage with Hitchens’ tough-guy stance (“Michael, my boy, let’s redo Telluride. Any show. Any place. Any platform. Let’s see what you’re made of”) we can take on board the basic problem of a kind of epistemological ethics that Moore’s film eschews. To comprehend this problem we should look at two things: at the idea of affirming contraries, and also the epistemological fracturing the essay film can incorporate to affirm these contraries. If Moore’s film fails, we should dismiss it not on the personal grounds that Moore is a liar, nor on the wholly impersonal idea of generic inadequacy, but something in between: that Moore fails to affirm the contraries because he’s mixing two modes that work against the thrust of an epistemological progress. On the one hand he’s making a propaganda piece, and on the other a rambling first-person take on recent American history. Had he simply decided that he wanted to make a film of anti-Bush propaganda in an attempt to oust the Bush administration, then he wouldn’t need to show both sides of the argument; he would just have to present his side extremely well. Any telling from the opposing side would be an argumentative device: a Socratic strategy to remove doubt from the viewer before moving onto the next point. If he wanted though to make an inquiry into his own perspective on America over the last five years then the flurry of footage going in all directions could have been valid as he searched out his own epistemological confusion: what are these incompatibles that have lead to America fighting two wars in the last three years and suffering the most horrific attack ever on their own soil? Moore’s problem, then, is chiefly one of positioning. When Hitchens and others say that Moore wants it all ways, we merely have to suggest that he wants to mix genres in such a way that he can offer some very intriguing footage, and to win an argument that is never really expressed. The film has the rhetorical flourishes of the certain, but the confusion of the tentative. If a filmmaker offers the individualistic as the certain then that leaves the filmmaker almost as a one-man ideologist. When the film concludes and we realise while the film’s decimated Bush, it hasn’t left the Democrats in very good shape either, we might think the film’s only real purpose would be as a party political broadcast for the Moore party. This seems to have been already half-acknowledged by the Democrats who’ve been careful to avoid close contact with Moore and his film. 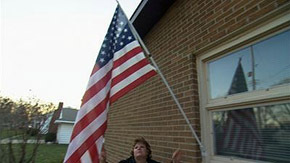 As Time writer Richard Corliss quotes one senior Democrat strategist saying “John Kerry has stayed away from Michael Moore, and that’s very smart.” (5) If we look at the film as one which works finally as a hymn to Moore’s own individual perspective we can see it makes a certain type of sense: we have to see that the democratic process isn’t working in America. Terrorists want to attack because of the corrupt governments, the Democrats allow the Republicans to win elections and the whole system is insidiously run by the Saudis. Who remains to run the country but Michael Moore, as the successor to Ross Perot or Ralph Nader? Of course this could be going too far, and some critics, like Paul Dale and B. Ruby Rich, reckon Moore should simply be seen within an American individualist tradition. Dale quotes Thoreau, while Rich believes him to be a ‘Libertarian individualist.” (6) Anything that smacks of compromise, anything that suggests the US is being bought off or bought up leaves a Libertarian individualist looking askance. It’s this “askanseness” Moore captures particularly well, as he tries to tap into a counter-righteousness. 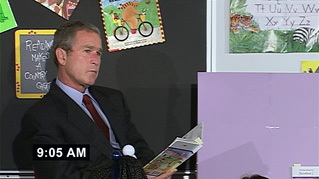 Fahrenheit 9/11 is thus a strange type of propaganda which has little to do with an agitprop approach that aims to address a mass movement. Rather, it’s an agitprop of individualism (a very American form?) of the kind exemplified, explored, and personalised before the event in Robinson Jeffers’ great poem “Shine Perishing Republic”, with its line “but for my children, I would have them keep their distance from the thickening centre, corruption” (7). Bush thus functions as a metaphor of decay in a country that is losing its values. Many scenes that serve no apparent purpose at all – like Moore looking round Flint and seeing America’s war on itself – become central as Moore moves from one scene of righteousness to another. But it’s a cul-de-sac form that contains a paradox Moore seems unwilling to try and resolve. When he says America is a “50/50/50 country. There are those who vote, who seem evenly split, but then there’s the 50% who don’t vote, and no one pays attention to them” he offers neither an intellectual nor a political solution to this problem – he doesn’t even really hint at one. And yet his tone demands an affirmation of the contraries at work in his film, the sort of affirmation that could justify American soldiers’ confused response to the Iraq situation, or help explain why Gore accepted defeat so readily. The big problem with righteousness is that it allows emotional absolutes and intellectual confusion. It allows us to be angry with many aspects of our lives, but doesn’t really find a way out of the impasse. …as distance lends a more synthesizing outline to the past century, its essentially political character becomes clearer to us. Western man underwent an apprenticeship in politics, a kind of life hitherto confined to ministers and palace councils. Political preoccupation, that is consciousness of and activity in the social field, spread among the masses, thanks to democracy. In many ways what the essay film tries to do – in the work of Chris Marker, of Werner Herzog, of Errol Morris – is return politics to the first principles of personal enquiry. They want to make the political aspect a reflection of the personal that then mushrooms into the political. So for example in Morris’s The Fog of War we have the former Defence Secretary Robert MacNamara explaining the motivation behind his key political decisions. Out of this close scrutiny of one man’s mind come the wider political implications. In Chris Marker’s Level Five (1995) we have a woman whose emotional disillusionment is paralleled by the horrific incidents in Okinawa during WWII where many Japanese took their own lives and the lives of their families to avoid capture by the Americans. Now what Morris and Marker offer is very different from what Moore offers. Morris and Marker, if in very different ways, want the personal to instigate an investigation into the general. Moore on the other hand wants to start with the general and then uses individuals to symbolise the political broad-strokes he works within. Thus, finally the woman here who loses her son in Iraq isn’t a grieving mother whose grief Moore wants to explore, but a mother whose grief is useful for Moore’s own political ends. It’s this outside-in political position that leads also to Moore’s contradictions concerning the American troops. The soldiers’ own perfectly understandable internal contradictions have to be ignored for the bigger picture, the political picture where the individual is subordinated to the general. When we mention Jeffers, Miller and Bukowski we are talking about those minor victories of affirmation which are capable of immediate contradiction by the continually changing self, who is trying to chase specific feelings and make sense of them as well as possible. This is what Moore doesn’t do because he’s constantly appropriating experiences – be it a mother’s tragedy, a soldier’s despair, a police officer’s frustration – in the same way that he accumulates footage: to some vague and hugely ambitious end that leaves us feeling utterly helpless in the face of so much contradictory reality. By the end of the film we might think Moore hasn’t so much created a work of counter-righteousness but of additional confusion. If for many of us the problem with Bush’s war on Iraq was the contradictory evidence that added up to no argument at all, we might believe Moore’s documentary arrives at exactly the same place from more or less the opposite political position. Neither Bush nor Moore take us where we need to go, and that’s because they’re so busy pointing fingers at others, that there’s no way of suggesting a direction in which to move. A.N. Whitehead, Adventures of Ideas, p. 59, Pelican, London, 1948. Amy Taubin, Sight and Sound, “Mission Improbable”, July 2004. Paul Arthur, Film Comment, “Essay Questions”, Film Comment, January–February 2003. Christopher Hitchens, “Unfairenheit 9-11: The Lies of Michael Moore”, Slate, June 21, 2004, accessed September 2004. Richard Corliss, “The World According to Michael”, Time Magazine, July 12, 2004, accessed September 2004. Paul Dale, The List, July 8, 2004. Robinson Jeffers, “Shine Perishing Republic”, in The Poetry of Robinson Jeffers, Penguin, London, 1989, p. 300. José Ortega y Gasset, “Meditations on Quixote” in The Origin of Philosophy, trans. Tony Talbot, University of Illinois Press, Urbana, 2000, p. 42.